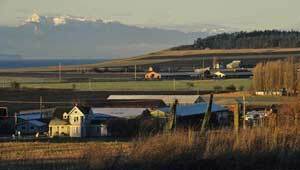 After six years, TPL finished the final chapter in a successful tale of preserving a family's heritage of farming and conserving a total of 414 acres for Ebey's Landing National Historical Reserve on Whidbey Island. The Engle family has farmed and owned this land since the 1850s, but when increasing financial strains forced the farm to file bankruptcy, they realized their beloved land would soon be threatened with possible subdivision and development. TPL purchased the Engle Farm property in October 2000 and protected 109 acres with conservation easements held by the National Park Service. The Engles were able to pay off the farm's debt and continue to farm much of the land while the remaining 305 acres were transferred to the National Park Service in the fall of 2001.